The daughter of Chaos, a shadowy figure, Nyx stood at or near the beginning of creation and mothered other personified deities such as Moros (Doom), Keres (Destructon), Thanatos (Death), Hypnos (Sleep), the Oneiroi (Dreams), Momus (Blame) and Oizys (Pain, Distress). Her appearances are sparse in surviving mythology, but reveal her as a figure of such exceptional power and beauty that she is feared by Zeus himself. NYX is Night. The Brvtalist, drawing inspiration from Hades, lord of the underworld, joins forces with NYX to conjure a gathering of mythical and contemporary forces to celebrate the continuation of their collaboration. 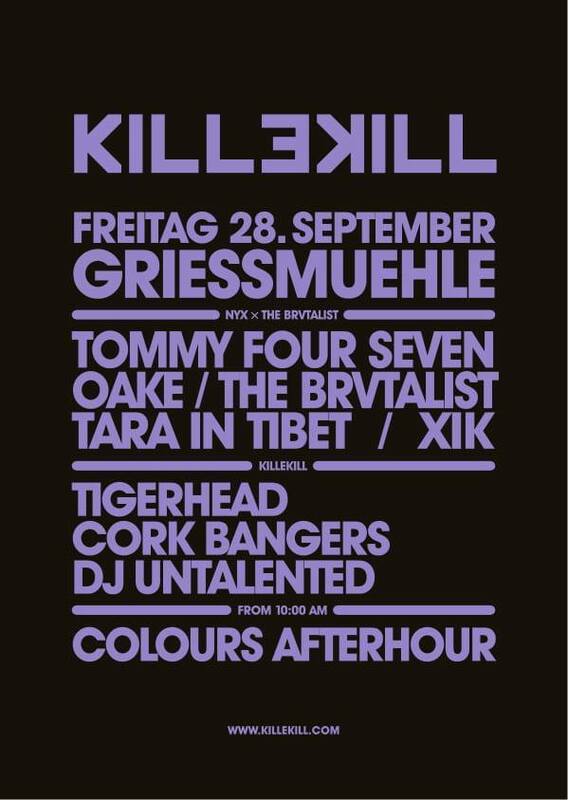 The Killekill floor is being headlined by TIGERHEAD who is being backed up by label boss DJ Flush & Irish Jamie Behan under their alias CORK BANGERS and DJ UNTALENTED, a new talent. Expect some proper banging techno down there.